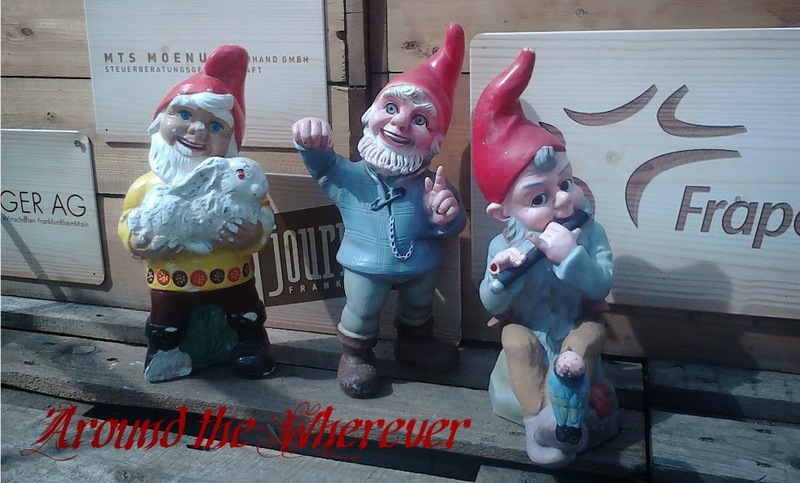 Around the Wherever: My week: May 6 ed. My week: May 6 ed. I haven't written one of these in months, if not a year or so, and I have a ton of things to do around the house right now, so it makes perfect sense to write an update instead, eh? Last year's focus was to take and pass the B2 Deutsch als Fremdsprache test from telc, which I did. I also wanted to join a club where I'd have to speak German all the time and volunteer (the latter doesn't have to be in German). I started, and have continued, both of those tasks, too, and it has made for a very interesting way to pass my time (in addition to working, of course!). Something I didn't plan to do was break my ankle, which I did during a trip to Austria in December last year. It took three months before I could walk without crutches, and while I'm off them and even hiking again, my ankle isn't the same. Maybe someday I'll blog about that too, as it was quite the (not recommended) experience. Anyway, now I'm back in the swing of things. I've been taking two different C1 German classes since the winter, so those are keeping me busy several nights a week, this week not excepted. As has been typical with my German-learning journey, I'm still vacillating between "yeah! I'm totally getting it" and "whoa, why is it that I can't even get the gist of this article, and I'm supposed to be so far along in German?" My biggest problem still is vocabulary and I've been very remiss in learning it. Folks, learn from my hard-hardheadedness: don't get behind in learning vocab or you'll be sorry! I'd like to take the C1 test late this year or maybe next year, but first I have to catch up on vocabulary. I continued getting in touch with nature by taking a class about foraging wild foods from a local club. A. came with me and we learned how to make tasty food from daisies, stinging nettles, and dandelions. Our favorite dish was a "pizza" made with a "sauce" of stinging nettles and onions cooked in olive oil with seasonings. We received a free booklet that had been sponsored by the club and the state government that tells of the benefits of allowing wild plants to thrive. For example, there is a type of butterfly that only likes one kind of stinging nettle. The booklet mentioned some people who have arthritis use stinging nettles to help with arthritis pain. I'm such a smart...alec, that I had to keep myself from saying, yeah, well, duh, if you're itching from the nettles, the arthritis might take a backseat for a while. It was also Maimarkt time, which is a giant trade show-travel market-horse show-and more in Mannheim which occurs at the end of April/beginning of May. Last year we didn't go for some reason, but this year A and I promised ourselves we'd go. It's hard to resist, especially since it's an easy train ride and the transportation ticket and entry fee is just less than 10 euros. 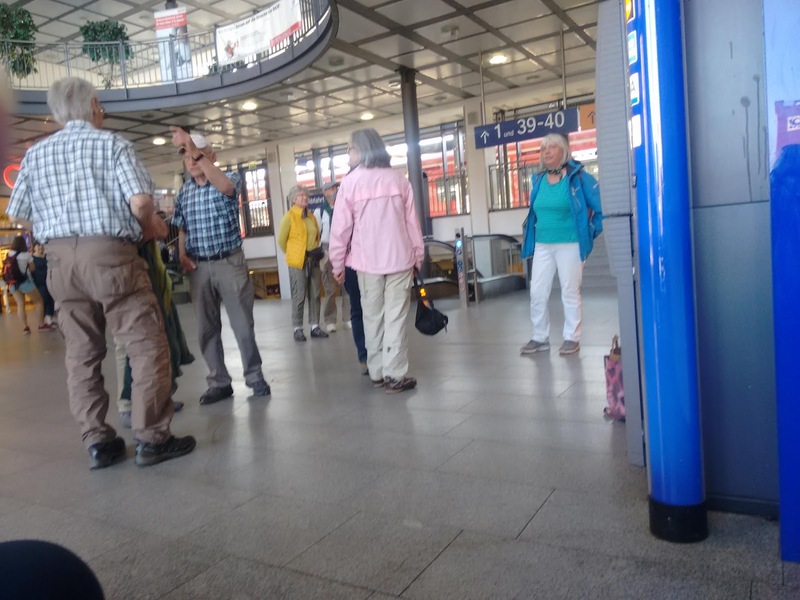 As we were waiting for the train, herds of elderly Germans descended upon the station. I had to stifle a giggle (again, I'm a smart alec) because they were wearing a "uniform" of sorts. 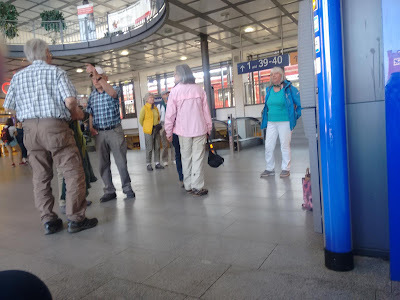 Whenever elderly Germans do something that they feel is somewhat sporty or active, they exhibit a propensity toward wearing a checkered button-up shirt, Jack Wolfskin adventure trousers (and often the kind that zip off into capris, men included, and preferably in khaki, taupe, or gray), and either hiking boots, or even better yet (or worse, depending on how you look at it!) sandals WITH SOCKS. This is only part of the group and see what I mean? They're mostly dressed the same and it turns out that they had the same destination we did: the Maimarkt, which doesn't really warrant hiking clothing as it's a flat area with exhibition tents. Dear super-crunchy vendor at the Maimarkt: I am giving you the side eye (that sometimes turns into an eyeroll) about your bragging about how healthful and wholesome your food is. When I asked you if you added sugar to your chili sin carne, you said yes (I just had a feeling that you did - people looooove to add sugar to savory food in Germany). There is no good reason to add sugar to chili. It is not a dessert. If you want to have healthful food and advertise it as such, please don't add unnecessary and unhealthful ingredients to it. If you need to add flavor, please consider trying herbs and spices instead. I tried two other savory dishes (one Thai and one Indian) and the vendor had added sugar to those, too. It would've been so much better without it. Also, for those who rail about how unhealthful American food is, yes, it CAN be very unhealthful, but European food is not sinless either. All of Western cuisine could benefit from not using so much sugar, sodium, and fat. After our unnecessarily sweet lunch, we made sure to peruse the travel booths and of course came up with many more places to add to our already too-long mental list of places we want to visit. When I got home, I took my bike out to forage for some nettles around the city. I then made some vegan, no-sugar added nettle soup that turned out quite well, if I do say so myself, with various frozen veggies from my freezer and vegetable stock. It was a good week.